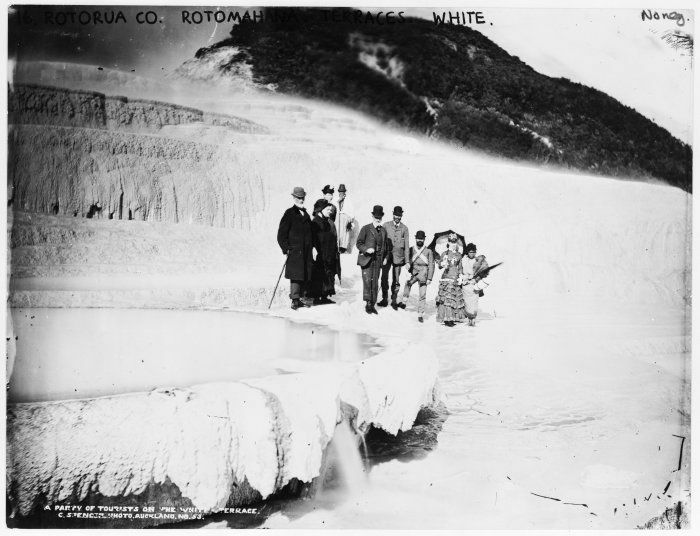 The annual focus on speaking Maori, Te Wiki o te Reo Maori (Maori Language Week), has rolled around again, from 23–29 July 2012. It’s been an annual event since 1975, building on the inaugural Maori Language Day instituted by Maori in 1972, but it took a 1986 Waitangi Tribunal report to help secure official recognition of te reo Maori and the resources needed to preserve and nurture the language. Action on the Tribunal’s recommendations included the establishment, 25 years ago, of Te Taura Whiri i Te Reo Maori (the Maori Language Commission) to promote te reo Maori. For God’s sake, let my young son learn his native tongue. It is not a foreign language. It belongs to this country. But he cannot learn Maori because it is not taught to him. I hear you speaking in Maori and I don’t know what you’re saying. The dismissal of their language as useless is the most deep-seated cause of resentment amongst the Maori population today. There is a widespread feeling amongst Maori that the authorities discount everything Maori and wish them to become brown Europeans. The Maori idea of integration is that both peoples have something to contribute to the future New Zealander. 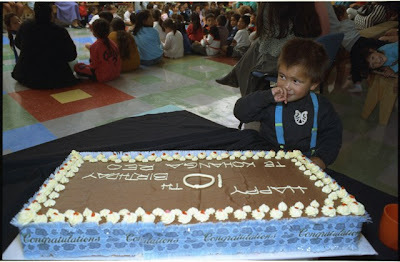 …There is a sort of hopeless resignation to the fact that Maori children will always be at the bottom of the class. Nothing could restore Maori morale more swiftly than the introduction of Maori language teaching on a wide scale. New urban-based Maori groups such as Nga Tamatoa advocated activism not assimilation, and promoted te reo Maori. A Nga Tamatoa petition calling for the promotion of the Maori language and signed by 30,000 people was presented to Parliament by Matiu Rata on 14 September 1972. That was the first Maori Language Day, an annual event later promoted by Te Reo Maori Society. 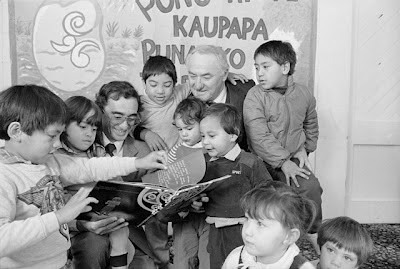 Other initiatives to bolster te reo Maori included New Zealand’s first officially bilingual school at Ruatoki (in Te Urewera) in 1978, the introduction of Koha, a half-hour Maori television programme, in 1980, followed by the 1982 opening of the country’s first kohanga reo (‘language nest’, or Maori language pre-school), at Waiwhetu (Lower Hutt, Wellington) in which te reo was taught in a Maori context, rather than the Pakeha education system. Worthwhile efforts all, but they fell way short of the “language rescue operation” called for by the Maori Education Advisory Committee. In the first place, te reo Maori still had no official standing, as shown by the ‘kia ora dispute’ of 1984. The national controversy erupted after Helensville national telephone tolls operator Naida Glavish (Ngati Whatua) moved to the Auckland exchange, bringing her standard greeting to callers: “Kia ora.” Her new supervisor insisted that she use only formal English greetings and when Naida declined, she was demoted. When the issue went public she received widespread support: airline pilots greeted passengers with a friendly “kia ora,” a song called ‘Kia Ora’ was released, and people called the tolls exchange asking to speak to ‘the kia ora lady’. Prime Minister Muldoon quelled the furore in his autocratic, no-nonsense way: “Well, I don’t care if she wants to say ‘kee-uh-ora’. Just as long as she doesn’t say ‘Gidday Blue’.” Naida was returned to her post and was even promoted to the international tolls exchange, where she continued to say “Kia ora.” Ironically, a few years earlier, Muldoon’s Maori Affairs Minister, Duncan MacIntyre had urged public servants to answer the phone with “kia ora” during Maori Language Week, but the ‘kia ora dispute’ showed how little this meant for the other 51 weeks of the year. In 1985, Nga Kaiwhakapumau I Te Reo (the Wellington Board of Maori Language) lodged a claim with the Waitangi Tribunal for te reo Maori to receive official recognition. It argued the language because was a taonga which, under Article II of the Treaty of Waitangi, the Crown had a duty to protect. During its month-long inquiry into the claim in 1986, the Tribunal was informed that only one in eight Maori were fluent in te reo but that most of the fluent speakers were elderly and that amongst school-age children, just 1 in 20 were fluent. The language is the core of our Maori culture and mana. Ko te reo te mauri o te mana Maori (The language is the life force of the mana Maori). If the language dies, as some predict, what do we have left to us? Then, I ask our own people who are we? 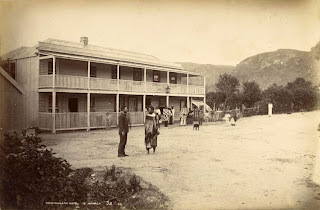 The Tribunal heard evidence from elderly Maori of the punishment meted out to them whenever they spoke te reo Maori at school, even in the ‘Native Schools’ first established for Maori education under the Native Schools Act 1867. The Education Department insisted that there had never been a policy against te reo Maori but, as Sir James told the Tribunal: “The facts are incontrovertible. If there was no such policy there was an extremely effective gentlemen’s agreement!” He recalled being sent into the bush to cut a piece of pirita (supplejack vine) with which he was strapped for speaking te reo Maori within the school grounds. 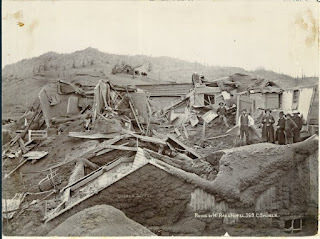 Others recounted: “Na te korero i tetahi kupu Maori i tonoa matou ki te tiki kohatu, ka wepua ranei” (For speaking one word in Maori, we were sent to go and get stones or whipped). After World War Two, many Maori speakers ceased to pass on the language to their children, seeking to avoid the punishment and disadvantage they had suffered at school, and to help their children flourish during a time of mass Maori migration to the country’s growing cities. An increasingly urbanised and young Maori population heard very little te reo Maori, growing up in a monolingual environment with a monolingual media. The Tribunal reported that te reo Maori could no more survive in such an environment than could an oyster bed when its environment became polluted. 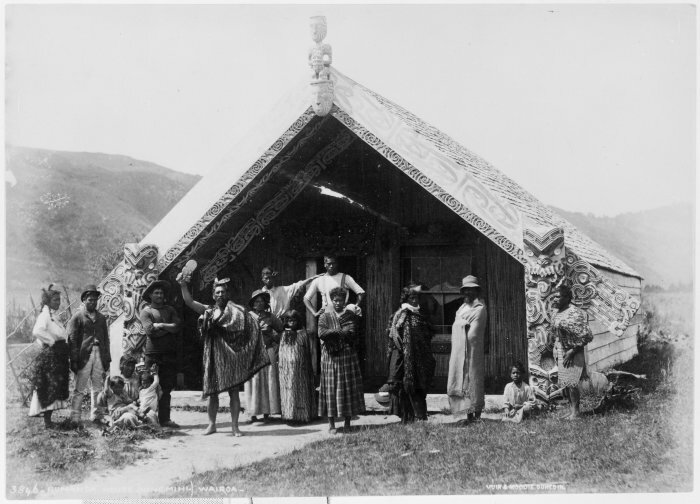 To illustrate the extent to which te reo Maori was still disadvantaged, the Tribunal set out why Maori could not speak their own language in Court. This was the result of a 1979 case involving the Maori activist Te Ringa (Dun) Mihaka who, after the District Court refused to let him address the Court in te reo Maori, appealed to the High Court and, in 1980, to the Court of Appeal. 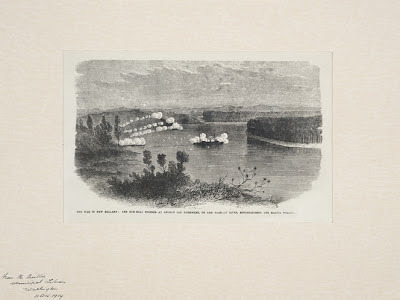 Acting for himself, he relied on the Treaty of Waitangi for his case but while the Court of Appeal agreed that, “the use of the Maori language in New Zealand is a matter of public importance,” the Treaty had no legal bearing on the matter. 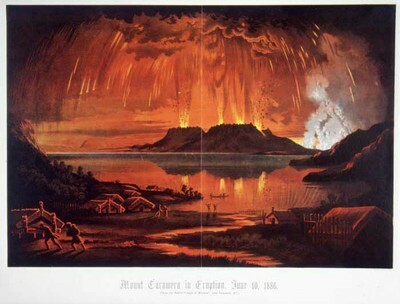 The Court based its decision on the English common law that had been transferred to New Zealand after 1840. 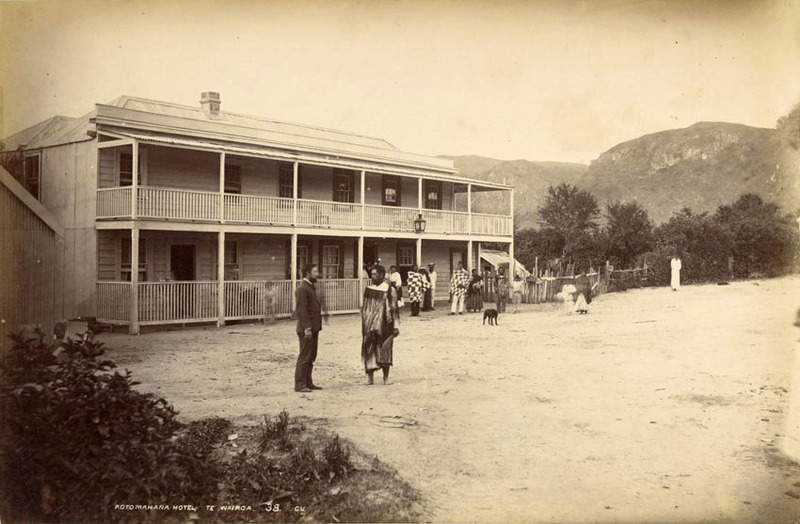 The Treaty was directed to ensuring a place for two peoples in this country. We question whether the principles and broad objectives of the Treaty can ever be achieved if there is not a recognised place for the language of one of the partners to the Treaty. 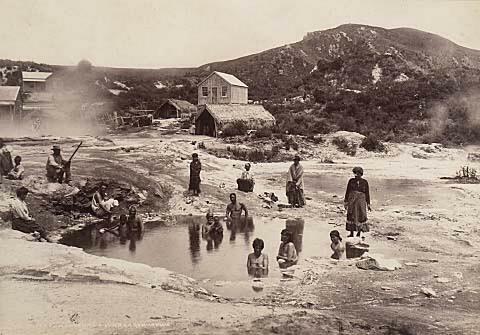 In the Maori perspective, the place of the language in the life of the nation is indicative of the place of the people. The Tribunal examined some of the common arguments used against official recognition of te reo Maori. 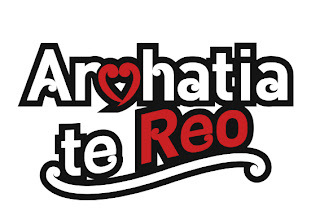 These included statements such as: Maori people can speak English anyway; official recognition is an empty gesture; the Maori language cannot adapt to the modern world; it is not an international language; minority languages die out naturally and should not be imposed on the majority, and; te reo Maori will be divisive. The Tribunal responded that recognition of te reo Maori did not mean that it would be imposed on others, only that Maori would officially be allowed to use it. Te reo Maori was described as an adaptable language, and just as capable as English of incorporating new words. Wales, Belgium, Finland, Sweden, and Canada were referred to as examples of countries in which minority languages had survived and flourished through official recognition. Finally, the Tribunal believed that it was more divisive to continue to impose one language or culture on another, rather than showing respect for the differences between two languages and cultures by giving both official recognition. 1. To legislate to allow te reo Maori to be used in courts and dealings with local and central government. 5. To provide for and promote bilingualism in the Public Service. Further changes followed, including the formal recognition and promotion of kura kaupapa and wananga under the Education Amendment Act 1989. The sale of some state-owned broadcasting assets from 1990 onwards led to Maori legal action and further Treaty claims (WAI 26, WAI 150, and WAI 776) relating to the need for a larger and more secure place in the electronic media for te reo Maori. The result was further changes to Maori broadcasting policy, including the reserving of radio frequencies for Maori, the establishment of the Maori funding agency Te Mangai Paho in 1993, and the emergence of a Maori television channel. The Maori language is the mauri of Aotearoa. It is our only unbroken link with the country’s human history. Without it, we’re just bleached driftwood abandoned on the shore. Ki te toitu te whenua, ka mau te Maoritanga. Ka ngaro te mana Maori. It is a little known fact that, under certain circumstances, the Waitangi Tribunal is able to make binding recommendations. Although the Tribunal has had this power for nearly a quarter century, only once has it so far opted to exercise this option. So what were the circumstances in which it did so? Here, we look back briefly at the history of the Turangi claim. 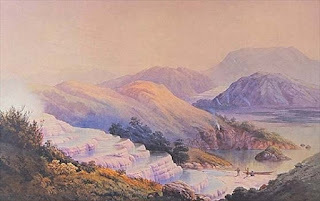 In the 1950s the Crown drew up proposals for what at the time was the largest hydro-electric development in New Zealand. The Tongariro Power Development scheme would require a large work force and therefore accommodation for the construction workers for the many years it would take to complete the project. 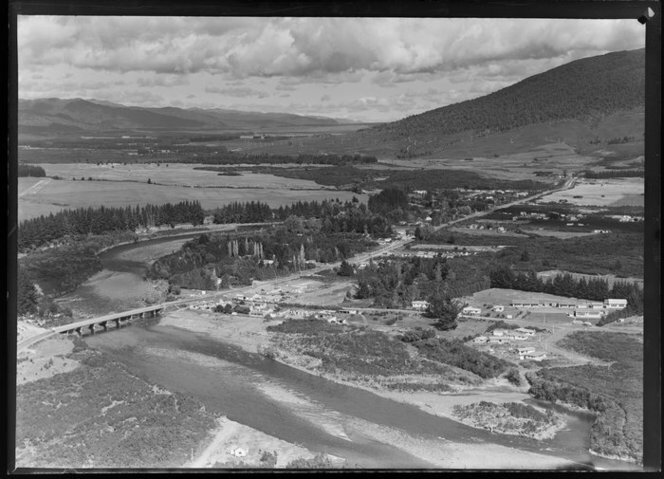 In 1964, following some discussion with its Ngati Turangitukua owners, Turangi was chosen as the site for a new township for these purposes. 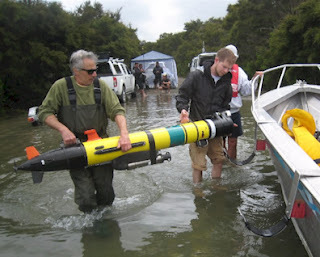 Ngati Turangitukua had agreed to the proposals in principle on the basis of various undertakings and assurances received from the government. These included undertakings that land required for industrial purposes would be leased for a period of 10-12 years and then be returned to the owners, and assurances that the total area required for the township would be no more than about 1000 acres. 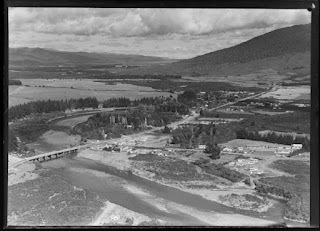 In the event, some 1665 acres was acquired by the Crown, mostly compulsorily under the provisions of the Public Works Act and the Turangi Township Act of 1964. This included the industrial area the government had undertaken only to lease. Bulldozers were sent into to the area within days of the final Cabinet go-ahead for the project and even before the land-takings had been legally proclaimed. 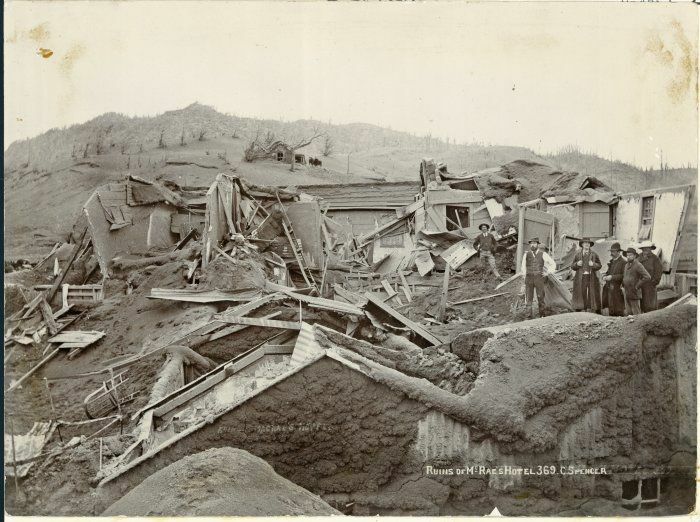 The next two years were traumatic ones for Ngati Turangitukua as their land was levelled and a new township was formed almost literally under their feet. Wahi tapu (sacred places) were desecrated or obliterated and the concerns of the tangata whenua completely ignored. 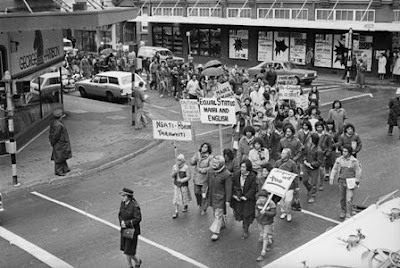 Following completion of the construction project in the 1970s the Crown began to sell off many of the lands it had compulsorily acquired from Ngati Turangitukua. Yet the tribe was not given the first right of purchase of these properties or provided with any assistance to re-establish an economic base for themselves. In 1990 Ngati Turangitukua filed a claim with the Waitangi Tribunal in respect of their grievances concerning the township. 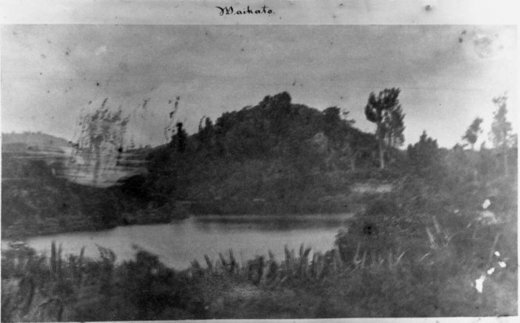 The Tribunal’s report, which was released in 1995, recorded 13 separate breaches of the Treaty of Waitangi in the Crown’s dealings with Turangi Maori, including the ‘draconian’ means by which Ngati Turangitukua’s lands had been taken and its failure to act fairly and honourably in its dealings with the hapu. Ngati Turangitukua and the Crown entered negotiations following the release of the Tribunal’s report. However, these subsequently stalled over the size of any settlement package. While Maori sought the return of properties valued at $6.3 million, the Crown offered considerably less. Many of the properties sold had memorials on their titles which provided for ownership of these to be resumed by the Crown in the event that they were required for the purposes of Treaty settlements. This provision had been introduced in 1988, following a Court of Appeal decision the previous year in favour of the New Zealand Maori Council, which had been concerned that the disposal of ‘surplus’ Crown assets would diminish the potential resources available to successful Treaty claimants. In most instances the Waitangi Tribunal could only make recommendations to the government, which it was free to accept or reject as it saw fit. But following the 1988 legislation the Tribunal could make ‘binding recommendations’, effectively ordering the compulsory return of memorialised lands (a similar provision was introduced in 1989 in respect of commercial Crown forests). Following the breakdown in negotiations, Ngati Turangitukua returned to the Tribunal, which in 1998 issued its first (and, so far, only) binding recommendations, requiring the Crown to return commercial properties worth some $3.2 million (and making further non-binding recommendations worth a further $2.9 million). The Crown and claimants had 90 days to reach agreement before the compulsory provisions took effect. In the event, a negotiated settlement was agreed on and the binding orders were never finalised. Ngati Turangitukua received a compensation package valued at $5 million, along with an apology from the Crown. Their mana had at last been acknowledged and a platform laid for the future development of the tangata whenua of Turangi.